Pacific Gas and Electric 46 is a single truck Birney car that ran in Sacramento, CA. Standard design. Car 46 was built by the American Car Company at their St. Louis, Mo. Plant in 1920. It is part of series 45 to 50. 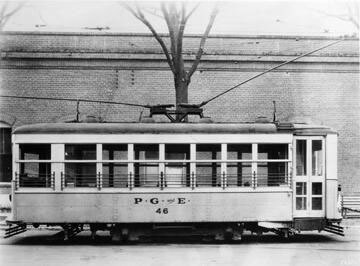 It was purchased by Pacific Gas and Electric for their Sacramento streetcar operation and spent its entire working career on this system. 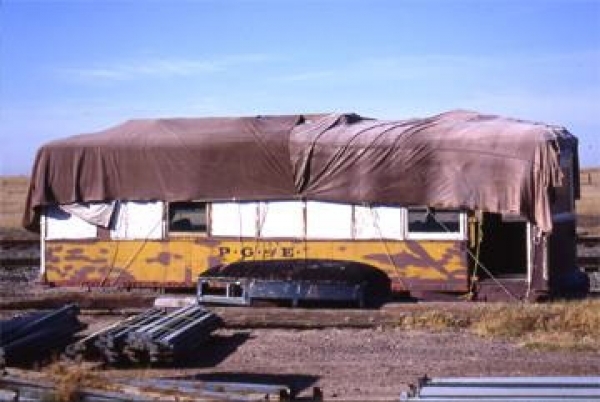 It was retired prior to Sacramento City Lines take over of the system in 1943. After retirement the car was used as a summer cottage on the bluffs above the American River in Orangevale, CA. It was acquired by the Museum in August 1983. Technical Data: Lightweight steel Birney car, eight window. Built by American Car Company in St Louis, Mo. in 1920. Order Number 1272. Seats 34. Total car weight, 16,000 pounds. Trucks: Brill (79E). Wheels, (24 inch). Axle. Journals, (3 1/4 X 6). Traction motors, 2-25 horsepower @ 600 VDC, inside hung. Air Brake Equipment: Westinghouse Traction Brake, (SME). Motorman’s valve, (M-28). Emergency Valve, (K-1). Double check valve, (#15). Brake Cylinder, (8 X 12). Dead man on controller and foot valve. Air Compressor, (CP-25). Dimensions: Width. Length over buffers, 28’. Height. Truck wheelbase, 8’. Propulsion Equipment: General Electric type K. Controller, (K 63). Traction motors, (GE264). Power resistors, (Type SG). Misc Data: Trolley wheel, (6”). Trolley Base, (US 15). Bell, (single stroke). Current Condition: This car is a body only. It is in excellent condition, but incomplete. Proposed Future Treatment: Restore body when resources are available. Display as body only or share Brill 79E1 truck with SN 62.